While in the city, Henry saves a woman from being hit by a car that plows into a storefront, but the woman’s husband, Jerry Simmons, is killed. Henry says the driver hit the man on purpose because he saw him smiling before he jumped from the car and ran. They get DNA from the airbag on the car which leads back to Tim Strebinski who has a long history of fraud and robbery charges. When Danny and Baez go to pick up Tim, they find him dead by hanging. Strebinski was a gambler who worked for crime boss, Mario Vangelis. Baez tried to take down Vangelis when she worked in Organized Crime but the charges never stuck. Turns out Whitney Simmons had ripped off Mario Vangelis in a real estate deal for $250K, but Vangelis thought her husband did it and killed him for it. When Whitney tries to run down Vangelis, Danny stops her and convinces her to turn over evidence against Vangelis so that they can arrest him. Jamie and Eddie come across Gabe, who is on parolee and claims he’s being treated unfairly by his parole officer, Don Vorhees. Turns out Vorhees is trying to force Gabe to use his former breaking and entering skills to plant evidence on other parolees. When Vorhees suspects that Gabe is talking to Jamie and Eddie, he claims he’s failed a drug test and arrests him. Then he sends another parolee, Leo Epps to Riker’s Island to kill Gabe, but Jamie and Eddie stop his plot and have Vorhees arrested. Chrissy Watkins gets an interview with Frank by claiming to be a part of the Columbia University newspaper but it turns out she faked her credentials. She then sprays graffiti on the NYPD flag and screams about police brutality. Turns out Chrissy is a friend of Nicky’s and used her to get the interview with the Police Commissioner. Nicky feels like an idiot when she realizes she got played. After taking flack at the Reagan family dinner, Nicky meets with Chrissy, but pretends to be on her side. Nicky learns of the next attack, which will involve throwing red paint on the bull statue on Wall Street, as well as throwing smoke bomb, and one million ball bearings to trip up the police and their horses. 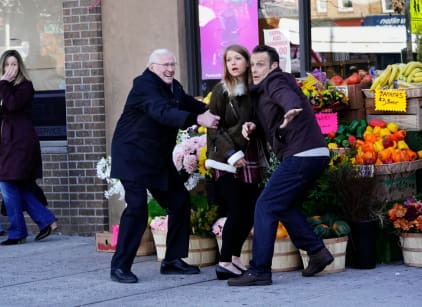 She tells Frank the details, but instead of letting Chrissy and her group go through with the attack, Nicky convinces them that too many people would get hurt and they cancel. Nicky: I feel like such an idiot. Frank: Then remember that feeling and learn from it. Permalink: Then remember that feeling and learn from it. I don't mind tough questions as long as my answers are printed accurately without any shade or shine.